I think next up will be a nice Christmassy piece...? 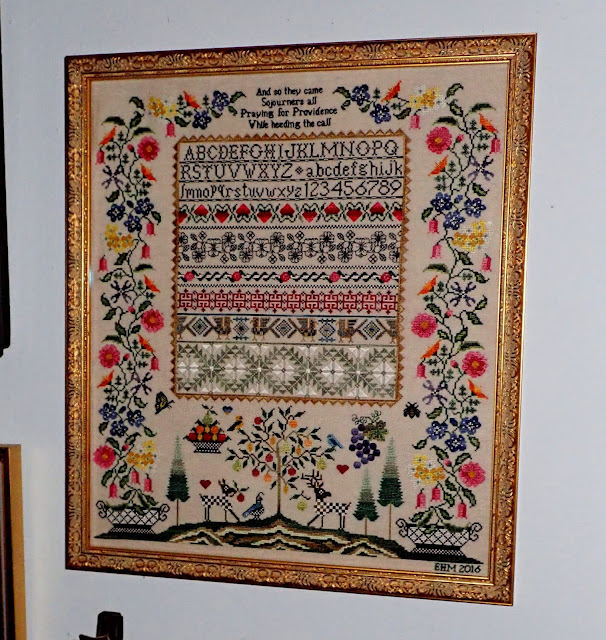 ... and here's where I have it hanging ... on my sampler wall along the staircase... I shifted a couple of things and made it work. When I thought about getting this one framed I felt it should be gold or golden color - since we are the "Golden State" and eventually it came down to two choices... so Rico picked this one and I really like his decision. This chart was originally commissioned for the Bay Area Sampler Guild and then only as a Class Piece... now its available for purchase at quite a few shops. There you go sports fans - more France soon - thanks for stopping by do stop again! Your work is simply beautiful...I have no other words. Bravo - well done! Love your sampler wall. It would make stair climbing a pleasure! You have made good stitching progress on your sampler. Love the frame job on Sojourner. Love your stitching and your finish. Your wall is amazing! I recognize so many of them from watching you post your progress!! 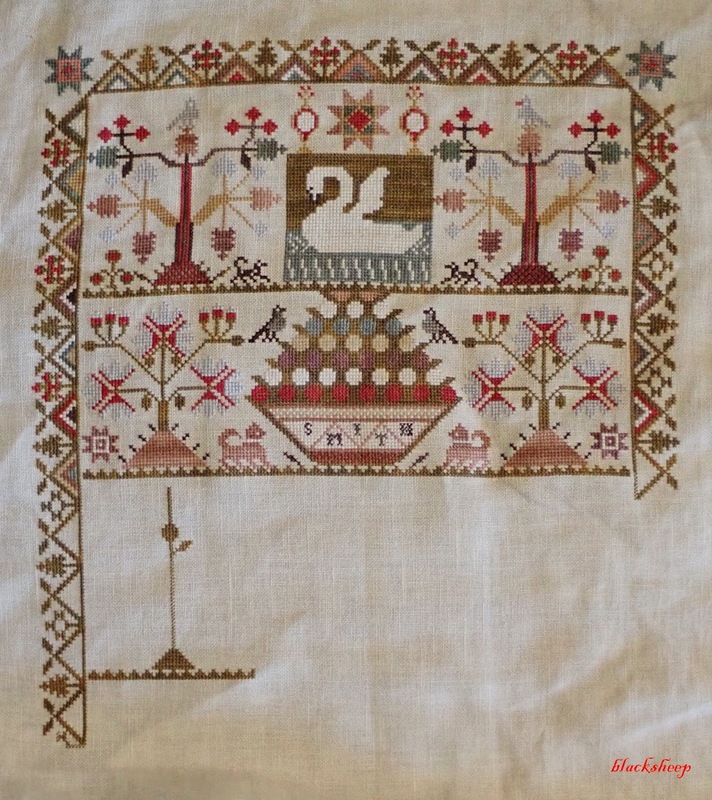 Your framed sampler is just beautiful. I love that sampler stairway!! exquisite and your workmanship superb. 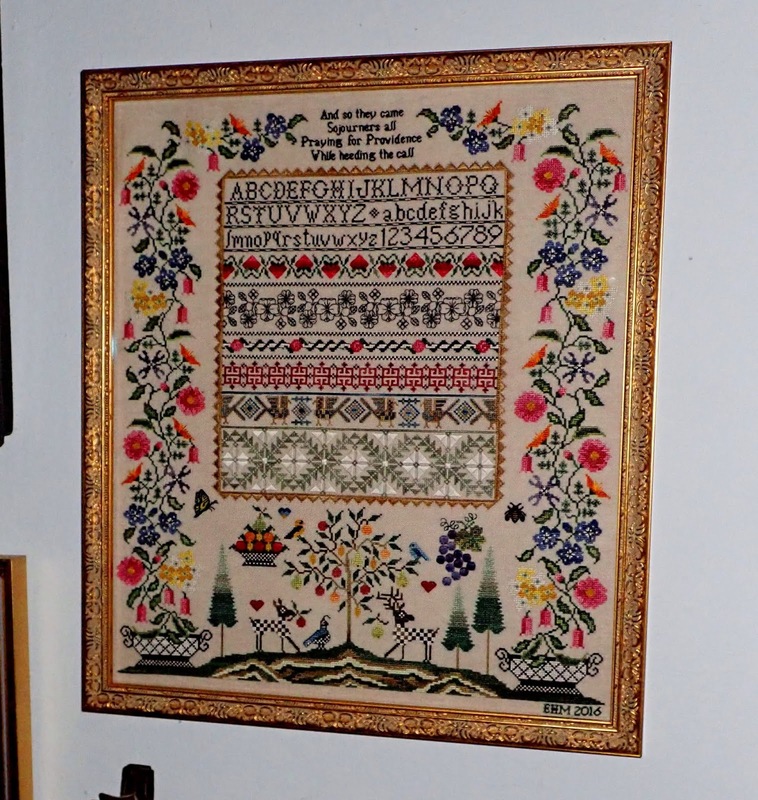 Edgar,Your sampler is absolutely gorgeous and the gold frame is perfect! I love your sampler wall!!!!! Your latest finish is simply gorgeous. I love the frame you chose. Thanks for the eye candy on the staircase wall! Sampler heaven! Edgar, love the sampler wall. I have begun to frame my samplers ( I usually just put them in a basket) for a wall too. Your stitching is beautiful! I enjoyed seeing your stitching wall.